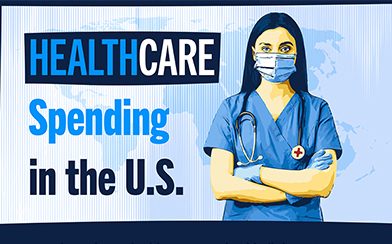 The United States healthcare system is the most expensive in the world, and our healthcare costs are projected to keep rising — faster than inflation, the economy, or wages. Despite these high costs, our health outcomes are generally no better than those of our peers, and in some cases are worse. SOURCE: Data from OECD, Health Data 2013, June 2013. Note: Data for 2011 or latest available. In 2012, total national spending on healthcare was $2.8 trillion, or 18 percent of the economy. Healthcare's high costs make it an important component of the budget in the short-term, and its projected growth path makes healthcare one of the primary drivers of our nation’s fiscal challenges in the long-term. This primer provides a brief overview of some of the major federal healthcare programs, and also examines the high costs of healthcare economy-wide (both public and private sectors) as well as the outlook for future health spending. The federal government spends, on net, about $1 trillion each year on healthcare1 and has become the largest single payer of healthcare costs, footing about one-third of the nation’s total bill. Many different groups of people benefit from these programs, including the elderly, the disabled, military and civilian federal employees, and low-income children and their families. Medicare is a major player in our nation’s healthcare system. The program covers 50 million elderly and disabled people. It pays for nearly 45 percent of all home health spending in the country, nearly 30 percent of all hospital bills, and more than 20 percent of all nursing care expenses. In total, Medicare finances 21 percent of all healthcare spending in the country. Medicaid, which provides insurance for low-income people, also pays for a wide variety of services, and covers 71 million Americans. The program pays for 40 percent of births in the U.S., and is the largest single payer of nursing home services. Although Medicaid serves both young and old people, more than half of its spending goes to elderly and disabled beneficiaries. Medicaid is funded jointly by the federal government and the states. In total, Medicaid finances 16 percent of all healthcare spending in the country. Health exchange subsidies, which were authorized by the Affordable Care Act (also known as "Obamacare"), are going to represent a larger part of the budget in the coming years. Beginning in 2014, exchanges will be administered by states and offer health insurance policies directly to individuals. To encourage broader participation in the insurance market, the federal government will provide premium and cost-sharing subsidies to individuals of low or modest incomes who purchase on the exchanges. CBO currently estimates that more than 20 million people will have purchased insurance on the exchanges by 2016. The Department of Defense managed healthcare program for military personnel, retirees, and their family. Healthcare costs comprise about 10 percent of the total DoD budget, up from 4 percent of the DoD budget in 1990, and will continue putting upwards pressure on long-term defense spending. The single largest tax expenditure enables employers to provide tax-free health insurance to their workers. The provision subsidizes employees’ health insurance by treating employer payments for their employees’ healthcare as a deductible cost of doing business, and also by excluding those payments from employees’ taxable income. Why Are Health Costs So High? Public and private healthcare costs in the United States are high for many reasons. A significant portion of healthcare in the United States is financed through "fee for service" payments. This type of system pays health providers for services they deliver, but not necessarily for quality of health achieved. Because providing more services produces more payments, fee-for-service can encourage unnecessary, ineffective, or even harmful care. One of the most defining characteristics of the healthcare market is the widespread prevalence of insurance. As a result, treatment costs are largely borne by third parties and not directly by patients themselves. Because insurance dulls patients’ and providers’ awareness of costs, it creates an incentive for costly care. Employees do not pay taxes on employer-provided health insurance. That tax subsidy hides the full cost of care, and encourages the overutilization of health services, which results in higher spending. Insurance, fee-for-service payment, and subsidies for coverage create incentives for the development and expansion of expensive medical technologies whose benefits may not be worth the extra costs when compared to alternative forms of care. According to CBO, the proliferation of these high-cost technologies is the single largest contributor to the growth of healthcare costs. Healthcare delivery in the United States is fragmented, which results in poor coordination of care among providers. This fragmentation creates costly inefficiencies in our system and exposes patients to the risk of duplicative, wasteful, and potentially harmful care. The legal system encourages the proliferation of malpractice and liability lawsuits, which in turn prompts physicians to over-treat and over-prescribe — a practice known as "defensive medicine." This drives up overall spending and creates a culture of overuse. Chronic conditions — such as hypertension, diabetes, and obesity — are on the rise in the United States. When these ailments are not managed carefully, patients suffer poor health and their healthcare needs increase. Indeed, patients with chronic conditions represent a disproportionate amount of healthcare spending. Although only 36 percent of all Medicare patients have four or more chronic conditions, the care for that population represents 74 percent of total Medicare spending. Higher income countries tend to spend more on healthcare, and the United States has one of the highest per capita national incomes in the world. Reducing healthcare costs will require reforming the incentives for consumers, providers, and payers so that wasteful and ineffective care is reduced or eliminated, while patients continue to receive the care they need. Accomplishing that task will not be easy. Healthcare reform needs to balance a set of legitimate concerns. Patients want to protect their access to care. Providers and hospitals must meet their own costs. The government needs to watch its bottom line. And taxpayers want their money to be spent responsibly. These goals are not always aligned, and the push and pull of the democratic process makes balance difficult to achieve. Most would agree, however, that it would be better to eliminate wasteful spending than to reduce access to necessary and effective care. SOURCE: Peter G. Peterson Foundation projections based on data from the Congressional Budget Office, Updated Budget Projections: Fiscal Years 2013 to 2023, May 2013, and The Long-Term Budget Outlook, June 2012. NOTE: Projections are based on CBO’s definition of current policy. The projections assume that excess health care costs grow halfway between CBO’s June 2012 assumptions and 0 percent. In considering these issues, we must recognize that the outlook for healthcare costs is daunting. Although the growth in healthcare costs has moderated in the last few years, according to government projections, total healthcare spending could still climb to nearly one-quarter of our entire economy within the next 25 years. Over the same period, federal spending on healthcare is projected to nearly double. Changing the way healthcare is delivered and financed in the future will require changes to the way our whole society — families, the elderly, employers, insurance companies, providers, the legal system, and, of course, governments — thinks about healthcare.